I’ve always loved meatloaf. Even when it contained meat! This is one of my favorite dishes to make. 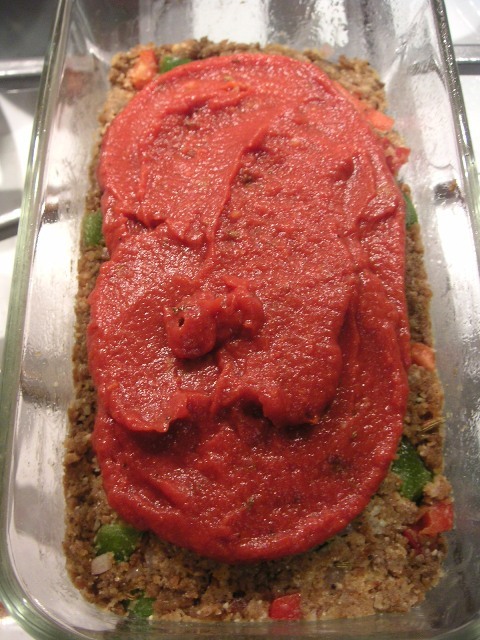 Very easy, you just take some veggie ground beef (I like Yves “Meatless Ground – original”), a 1/2 cup of Parmesan cheese, 1 diced bell pepper, a 1/2 cup of breadcrumbs, chopped shallot or mild onion, and about 1, maybe 2 eggs. Mix ingredients, and bake for about 4o minutes at 375 degrees. My secret is to crumble Semifreddi’s “Super Garlic Croutons” in the blender/food processor and make my own breadcrumbs. I made a tomato sauce for the top out of thinned tomato paste, oregano, salt and pepper, and placed golden heirloom tomato slices as a finish. Thanks, GP! As for the frites…basic russet potatoes, sliced into quarter inch width pieces. I read that in order to have crispy fries you need to soak them in cold water to remove excess starch, dry thoroughly, then fry them twice. The first fry was 325 degrees for about 4-5 minutes. The second fry was 375 for about 3-4 minutes or until golden. This method worked very well, I recommend it. Extra crispy and light! And the very best part of all is that I get to have it for lunch tomorrow!! Yum.